Officials in Calais are preparing to begin bulldozing the migrant settlements which have housed immigrants attempting to enter the UK for over a decade. 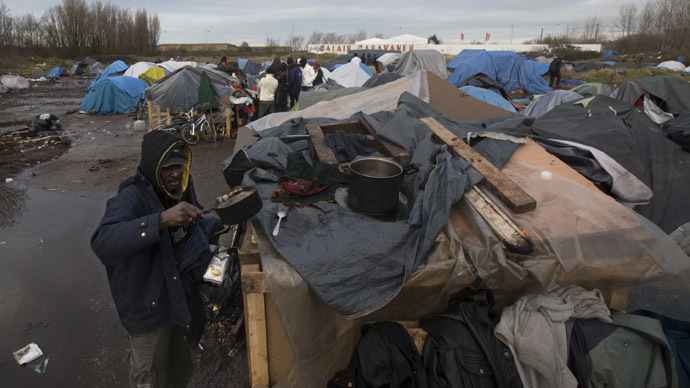 It was revealed Wednesday that the Prefect of Calais, Denis Robin, has given residents of the shanty town an ultimatum, telling them to remove their possessions and leave – or face forcible eviction by riot police. The eviction comes as a new permanent accommodation building for migrants was opened this week, with 50 women and children among its first residents Wednesday. There are plans to house a further 20. The new facilities are the first of their kind since the notorious Sangatte center was closed in 2002. Men will not be allowed to sleep in the center, but can use it during the day to shower and cook. French authorities are expected to start the evictions on March 31, and migrants who are still living on the land will be moved to wasteland near to the Jules ferry site. The mayor of Calais, Natacha Bouchart, has said she hopes the measure will aid authorities in controlling the 2,000 plus men, women and children who are currently attempting to gain access to the UK. She also said she believes moving the migrants will limit the influence of human traffickers, who exploit the dire living conditions to find and transport workers illegally. The site at Jules Ferry is a converted children’s holiday camp which will offer beds and food to women and children considered too vulnerable to sleep rough in the shanty town. It is situated next to another day center, opened Wednesday, which will serve 4,000 meals a day to migrants living in Calais. Both sites are just a half-hour’s walk to the ferry terminal. On Wednesday, however, charities working in the area said the new facilities would not necessarily help workers, and in some cases, even exacerbate the problem. Gonzague Van Isacker, from the charity Solid’R, said it would take women housed in the facilities an average of three months to get to Britain. The British government, too, has also argued that the permanent facilities will only increase the numbers of migrants waiting at the border to gain entry to the UK. “There is a danger that this camp will turn into a new Sangatte, with all the problems that entailed,” he said.